Children are picky. Let's face it, clothing, hair, FOOD - it's all something kids can be very particular about. In this house the food issue can be huge and there are several reasons for it, but in a nutshell the kids are very discerning about what seasonings I use. One of their favorites is a well-known national seasoning blend that they like on bagels, no matter what they're topped with. It so happens that we were out of that particular one when Lawhorn's Signature Seasonings All-In-One Professional Seasoning Blend showed up at the door. Everyone's favorite use, up-close and personal. My oldest son grabbed it from the shelf and used it, then the next child used it and the next and the next (and you do know I have 7 kids, right?) until everyone had tried it without my knowing. They were hooked and I've had to fight them off so I can effectively test it for myself and deliver results to my readers. Lawhorn's was developed by Tim Lawhorn, then Executive Chef and Assistant Food & Beverage Director of the Innverary Hilton Hotel in Ft. Lauderdale. Trying to help cut costs for the hotel, he began toying around with herbs and seasonings to come up with a blend that could be used on virtually anything and he hit the jackpot. The blend that he cam up with was so unique that it tasted different on everything it was used on. Skeptical as I am, I tried it for myself on everything I could think of. Pork, chicken, beef, shrimp, fish, veggies (zucchini with Lawhorn's is to-die-for). Yep, Tim Lawhorn is right, it really does have a different effect on each food. My personal favorite is Lawhorn's on pork, but the hands-down winner here (beyond the kids' cheese bagels) is mixed into ground chuck for just about the best burgers you'll ever eat. Worried about sodium? Don't! Lawhorn's contains 65-7-% less sodium than most 'seasoned salts', is made from 100% natural ingredients and is certified Kosher, as well. Give it a try, you absolutely must, because my telling you won't sell it, it really sells itself. Pick up a bottle at the stores listed here, or buy it directly from the website. While you're there, check out the blog, recipes, testimonials, history of Lawhorn's and even the commercial. Also give them a follow on Twitter and Facebook and tell them Anne sent you. Moist and rich in almond flavor, this is the perfect ending to any meal. Dust with powdered sugar, sliced almonds or even a chocolate sauce for an extra delicious dessert. 1. Preheat oven to 350 degrees F. Grease an 8-inch round cake pan. 2. Combine flour and baking powder and set aside. 3. Mix together almond paste and butter until smooth. Add sugar and beat until fluffy. 4. Add eggs and vanilla extra and beat until well combined. Add flour mixture until just blended. 5. Pour into prepared pan and bake for 30 minutes or until the top springs back when touched in the center. 6. Cool in pan for 5 minutes then turn out onto a rack to finish cooling. Sprinkle with powdered sugar. While you're here check out Sweets for Saturday at Sweet as Sugar Cookies. Sweetness overload you won't want to miss! I wrote in October of my trip to the New York City Wine & Food Festival sponsored by ShopRite and how I was able to meet Tyler Florence at a signing of his newest cookbook, Family Meal. The event was hosted at Abe & Arthur's and it was the first book signing I've ever been to. When I entered the restaurant I was handed a name tag and a hard bound copy of the cookbook. If you've read here long enough you'll know that I read cookbooks like any other book; from start to finish like a novel. I sat in the crook of a large booth, settled in with my water and began to read over the book. First, page by page, scanning and taking in the photos, then back to the start to read in earnest. I didn't notice much going on around me (except the flurry of activity when Tyler Florence was ushered in to his seat at the book signing table) and kept reading. I really couldn't pull myself away. We think alike about food and family on so many levels that I felt I could have written much of what I was reading. The recipes were at once familiar and different and I was intrigued. His fearless use of taboo fats and love for organic and fresh ingredients may not seem to go hand-in-hand, but it works very well and it's something I applaud him for. When it came time for my book to be signed I didn't close it, rather I stood in line still engrossed with reading and when I stood before Mr. Florence, I think I actually said something completely stupid about not wanting to stop reading long enough to have him sign it. I vaguely recall mentioning the 7 kids and the fact that we'd thoroughly test the recipes. Not sure whether that was a complete failure or not, but it was the truth and I would hope that he'd take it as a compliment. Kiki's Famous Coconut Cake - Perfection! I did read it through - several times now - and have made many of the recipes. It's full of tried-and-true favorites from his childhood, from his grown-up family life, from the potlucks shared with neighbors and even recipes from his restaurants. Don't miss the story about El Paseo, the restaurant he and Sammy Hagar opened together. Yes, Sammy Hagar of VanHalen fame is quite the foodie. 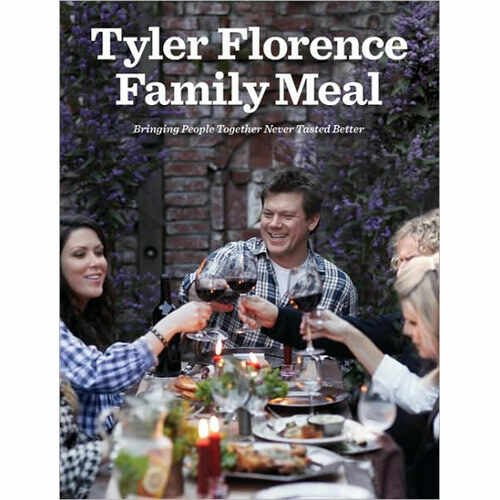 The stories throughout give a glimpse into Tyler Florenece's life that you don't get in other books, something you'll be glad you read about. He's far more down-to-earth than most and his love and passion for food are shiningly evident in this tome. The photographs are elegant and homey at the same time, conveying the diversity of Mr. Florence's repertoire. I took it upon myself to serve up a Sunday Dinner completely composed of recipes from this book and my family responded so well to it that it's now on the permanent dinner roster. What did I make? Chicken-Fried Steak with Southern Milk Gravy (perfectly seasoned), Buttermilk Biscuits (absolutely airy), Parmesan-Roasted Green Beans (my favorite part) and Kiki's Famous Coconut Cake (Divinity!). The verdict? Oh, well ... let me just say this, the next morning the 6 year-old and 4 year-old were asking if we could have steak and biscuits for breakfast, and the night before the 9 year-old wanted seconds at bedtime! Take note, those are my pickiest eaters. And you know, I have to say, I felt exactly the same way. While Asian cuisine is something I am particularly fond of, Malaysian cuisine isn't something I've delved into too deeply. 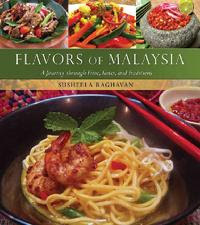 Flavors of Malaysia: A Journey through Time, Tastes, and Traditions by Susheela Raghavan is just the right book for initial exposure to the world of Malaysian food. It's packed with stories and facts about Malaysia and the food culture there. It's a colorful book in many ways; history, recipes and a beautiful center section of photographs. The author's own history and the history of Malaysia could be a book in itself, but having it added to this cookbook makes it that much more interesting and useful when confronting Malaysian cuisine for the first time. I tackled many recipes from this book including Lime Rice, Stir-fried Sambal Shrimp, Chicken Soup - Malay Style and Pineapple Tarts and each one was so flavorful and delicious even the youngest child in our home dove in and asked for seconds. Many areas of the country are coming along and now have markets offering foodstuffs from across the globe, but if you aren't so fortuitous, the spices necessary for these recipes can be found on the author's own website, Taste of Malacca. Have a look at the site and please do check out this book, you'll be very glad to know Malaysian food the way that Susheela shares it and so will anyone you eat it with. 1. Preheat oven to 350 degrees F. Grease a 9x13 baking dish. 2. Toss bread cubes with chocolate chips if using and lay in an even layer in prepared pan. 3. Mix together milk, eggs, sugar, cinnamon and nutmeg until smooth and well blended. Pour over bread cubes. 4. Cover with foil and bake for 45 minutes. Remove foil and bake for another 30 minutes or until puffy and golden. 5. Remove from oven and keep warm. 1. Beat eggs and sugar together until pale and lemon yellow with no streaks.2. Bring cream just to a boil in a heavy saucepan. 3. Remove from heat and temper the eggs with the cream-adding a quarter cup at a time-1/2 cup total- and whisking quickly so the eggs do not cook. 4. Put the cream back on the stove over a low flame and add the egg/cream mixture in a thin stream, whisking the entire time, until the sauce forms and is thick enough to coat the back of a spoon. 5. Remove from heat as soon as it thickens and add the vanilla, mixing well to combine. Serve immediately over the pudding. Makes about 2 1/2 cups. A couple days late with that sentiment isn't so bad, is it? I've been busier than I hoped I'd be this past year and the amount of posts I had is evidence of that. I don't do resolutions, but I do promise to try and be a bit more vigilant in 2011. I think I got caught up in wanting to write what I thought others wanted to read. That's all well and good because artists want to please their fans, but I also need to get back to why I started this in the first place and that was simply for me and my kids. This coming year looks to be filled with positive changes for us and I'll try and keep those of you who are loyal readers in the loop, but it's all good things, not easy and some rather difficult, but all for the best in the end. Here's a typical Southern recipe for the New Year, one that actually comes from my own upbringing. We aren't Southern, but the influence in the area of Indiana where my mother grew up was heavily Southern and many of her recipes reflect that. You can chill out some with the bacon here, but it really is necessary for the right flavor. Try and get organic produce when you can and feel free to substitute canned black-eyed peas if you like. 1. Pick over beans and rinse. Cover with cold water and soak overnight. 2. Drain water from beans and place in a heavy pot. Cover with 1-inch of water and bring to a boil. Reduce to a simmer and add 1 clove minced garlic, 1 bay leaf and 1 Tablespoon salt (the salt will NOT make the beans tough, that's an old wives' tale). Cook 45 minutes to 1 hour or until beans are cooked through. Remove bay leaf, drain well and set aside. 3. Heat the same large pot over medium heat and add bacon. Cook until crisp and add onion and garlic. Cook just until onion turns translucent. Drain grease and add chopped greens. Stir well and add 1 cup water, vinegar and cayenne. Lid tightly and reduce to a simmer. Cook for 45 minutes or until greens are tender. 4. Add drained beans and heat through before serving. 1. I write each and every post for myself first, if I make money from it due to third party advertising (Google and Foodbuzz) then so much the better. 2. If I write about a product, cookbook or restaurant, chances are that I received said product, cookbook or meal for FREE. 3. If I write a review about a product, cookbook or restaurant that wasn't FREE, you'll know it because I'll tell you. Local establishments (non- chain) are always written about gratis - I support local businesses and think you should too. 4. FREE product doesn't guarantee a positive review. All work is Copyright Anne Coleman 2005-2013 . Simple theme. Powered by Blogger.